Stan Prokopenko is a talented artist who runs the Proko online art course. He publishes premium courses with instructions for artists who want to learn how to draw from life. 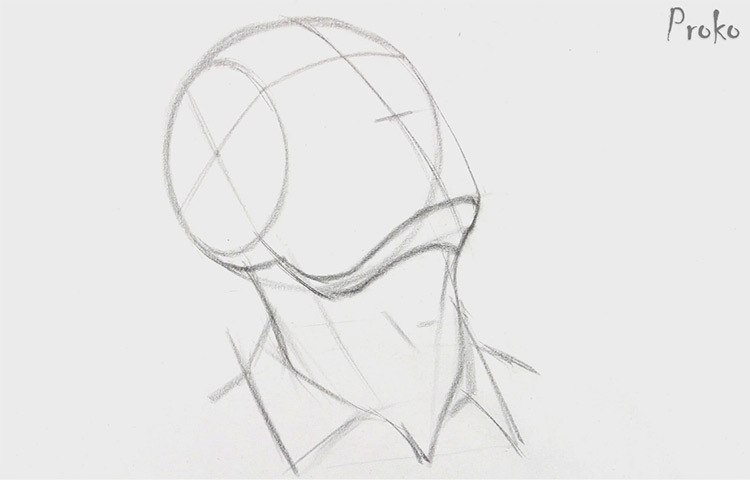 I recently reviewed his premium figure course and in this post I’d like to review his Portrait Drawing Fundamentals course. Although Stan released this portrait course before the figure course, I actually think it’s a more advanced area of study. The figure course is better for absolute beginners who want to see rapid improvement in all areas. There is a lot of value in the portrait drawing course, but it covers more detailed topics on rendering and forms. Beginners could start here but might have an easier time with the figure first. But there’s no denying that Stan’s portrait course is just as useful for aspiring artists. His teaching style is easy to understand and it’s simple to dive right in and start learning. The Proko portrait course naturally focuses on the head, face, and overall process of completing a portrait drawing. Stan’s methods follow closely with the Loomis method for drawing heads. It’s a concept that was covered in a few Loomis books like Drawing the Head and Figure along with Figure Drawing for All It’s Worth. But if you’re more of a visual learner then I recommend following this course instead. 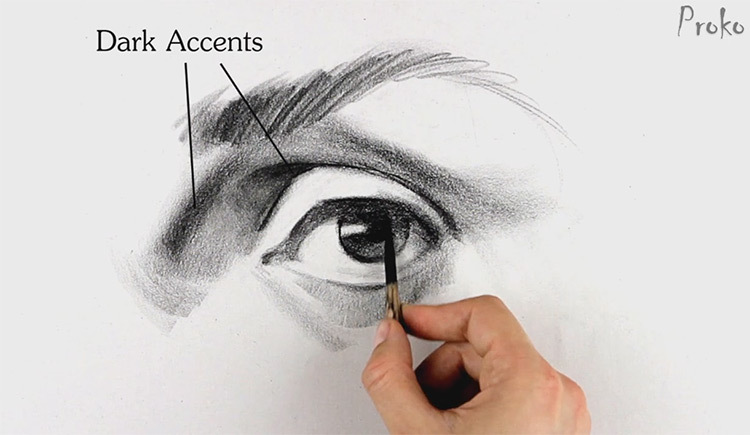 Sometimes it’s easier to learn visually by watching another artist demonstrate what to do. This is perhaps the biggest benefit of using an online course to teach yourself how to draw. Also note this portrait course is the cheapest course on the Proko website. It’s also the shortest in length and doesn’t come with individual chapters of content. But if you’re breaking into portrait drawing by teaching yourself then you couldn’t ask for a better resource. I would recommend starting with the free Proko videos first before grabbing this course. Check out the quality of the content and see what you think. There’s a lot to learn and you’ll need to put in months(and years) of practice to see real growth. But this course will guide you down the right path and teach you Stan’s way of analyzing and rendering portraits. All the videos in this course can be downloaded straight from the Proko website. Once you pay for the course you get access to a dashboard with download links for each video. Of course the videos can also be streamed in the browser if you prefer that method. But it can be useful to keep local downloaded copies if you’re ever stuck without Internet. All videos come in 720p HD quality as MP4 video files. These should play on any operating system with any standard media player program. Unfortunately I feel like the audio in this course isn’t as crisp as the figure course. I’m not sure if new equipment was used in the figure course but there seems to be a difference in quality. Certainly not unwatchable but definitely noteworthy. Also this course is a bit more hectic than the figure drawing course. I mentioned in my Proko figure course review about how that course was broken down into chapters. The portrait course has no chapters. Just a series of 18 videos. The first video covers materials and supplies. Videos 2-16 cover individual aspects of drawing features. These include the eyes, nose, ears, lips, and hair(among other facial features). Videos #17 and #18 are full-length portrait drawings from start to finish. Both videos run for well over an hour long. 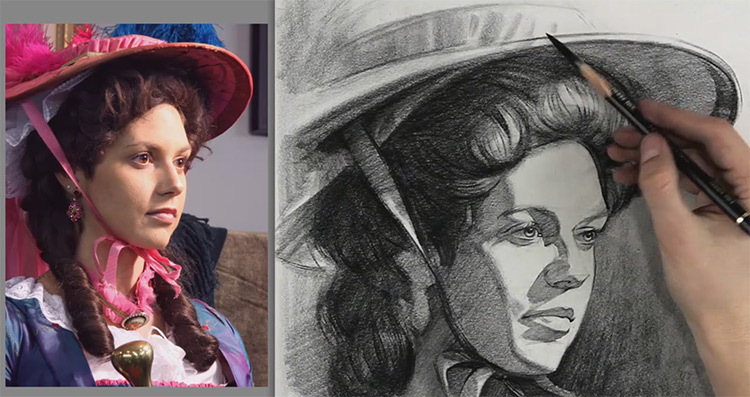 They feature a model posing on one side and Stan’s drawing on the other. You can watch in real time and even follow along with Stan’s instructions. The other asset you get in this course is a rotating 3D model for study and practice. You can see how features appear on the head from all angles. Very handy if you’re practicing your own portraits and need a quick reference for anatomy. However the 3D models are fully interactive so they require a web browser. This means you can’t download 3D renders, but you really wouldn’t need to anyways. Overall the video quality is exactly the same as all Proko videos, except for the audio feeling a bit drowned out. It’s not terrible and the videos are definitely watchable. This was Stan’s very first video course so it may not “feel” like his newer material. The biggest downside to the portrait course is that most of the step-by-step videos have already been released on the Proko YouTube channel for free. I explained this is somewhat true of the figure drawing course, but those videos are only clipped to be shorter. This means the premium figure videos are actually longer than the free videos, so you’re getting a ton of new content with every video in that course. However the free portrait drawing videos are the exact same length as the premium ones. This means the portrait video exercises can be found on YouTube for free. If you go to the Proko channel and scroll all the way to the bottom you’ll find 15 videos from the portrait drawing course. So why would you buy this course if most of the content is on YouTube? Because the premium portrait course has a few videos that are not on YouTube. These few extra videos total almost three hours of extra footage. Is it worth the price tag? That’s for you to decide. The videos which are not on YouTube show full start to finish portrait drawings by Stan himself. He has both a male and female model pose used for two portrait drawing studies. 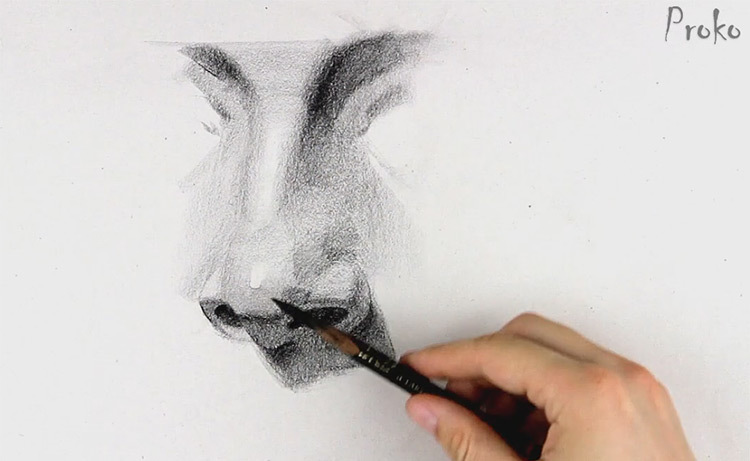 You can watch every step to see how Stan creates these portraits from scratch. Both of these full-length portrait drawings also include voiceover instructions which are huge for new artists. This is great content and it’s actually unfortunate there’s not more premium content for this series. The portrait course is actually the cheapest course and I hope it makes sense why. You also don’t get any extra model photos or poses to work from other than what’s in the videos. With that said I do think the full-length portrait videos are of high enough quality to justify the price. But this material will only be useful if you’re struggling with portraits and really need help to improve. I also think the background music is a little bland in this course. It’s nothing abhorrent or ear-shattering but I very much prefer his newer music in the figure & anatomy courses. Although most of this content is on YouTube it’s still much shorter than the actual demos. If you combine all the 16 videos on YouTube you get just over 90 minutes of content. The two exclusive premium portrait drawings together come to 180 minutes in total—almost double the entire length of all the other exercises combined. Because Stan talks during these portrait drawings you’ll still be learning along the way. This is a huge benefit for anyone willing to spend the money because you’ll learn a lot more by seeing the full demonstrations from start to finish. It can be intimidating to approach portrait drawing with little or no experience. But as an artist you’ll need to do quite a few self portraits over the years. This is a great exercise for working from life when you don’t have models available(or money to pay for models). Overall the learning experience for this portrait course is detailed but wanting. It would be incredible to have Stan update this course with new lengthier videos that cover portrait drawing in greater detail. But I don’t see that happening anytime soon. I can’t say this course will solve all your drawing problems. Portrait drawing is one of those things you’ll always be working to improve just like figure. If you don’t have money to spend then I’d say skip it. You can watch most of the individual lessons on the Proko YouTube for free. But if you’re dying to see full-length portrait demos from scratch then download a copy of this portrait series. It’s priced much cheaper than the other lessons and you’ll be supporting Stan to help him create even more awesome content. Ultimately I’d only recommend this premium course for artists who want to dig into portait drawing the Loomis way without reading a book. There are other methods to draw portraits and Stan’s method is not the only one. Add the fact that 16 of these videos are available for free on YouTube and it’s hard for me to outright recommend this course. If you can get by with the free lessons on YouTube then do that. If you want to support Stan or if you really want to see his start-to-finish portrait process then buy a copy of this premium course. Just don’t be surprised when you find all the pre-released videos in there too! Maybe if enough people message Stan expressing a desire for more premium portrait content he might update the course in the future. But in its current state I would only suggest buying this course if you’d like to learn Stan’s method of portrait drawing.